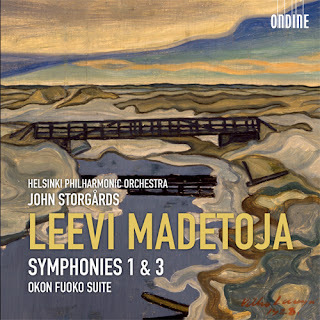 Never reluctant when it comes to new names I arranged to get a copy of the new CD of the music of Leevi Madetoja (1887-1947). Namely his Symphonies 1 & 3 (Ondine 1211-2), as performed by John Storgards conducting the Helsinki Philharmonic Orchestra. Madetoja was a pupil of Sibelius in 1908-10. Both shared the country of Finland as homeland. What strikes one listening to the symphonies and the bonus "Okon Fukuoka Suite", op. 58, is the fine meshed flair for orchestration. In that Madetoja nearly if not actually rivals his mentor. There is great color in these works. Storgards and the Helsinki Philharmonic do a fine job bringing all that out, along with the dramatic ebbs and flows of the music. The music has that Finnish late romantic flair of Sibelius as well. Knowing it took me a while to really appreciate Sibelius I have been patient, listening again and again. And I must say that the thematic material does not stay in my mind from one listen to the next. That is not to say the the music isn't well put together or in any way unpleasurable. It is that. And the themes are not at all banal. But I don't seem to be able to wrap my ears around the music. The Suite does strike me as a bit more fetching in that way, however, but not overwhelmingly so. I wont say it's the fault of Madetoja's music. It may be mine. I will certainly listen some more to this one, but at the point that I type this I have not been able to muster up much appreciation for the music. For that I am sorry. It sounds well. It just doesn't capture my musical memory cells.